Gold IRA Guidegeneral Will September Confirm The Seven Year Itch Fears? Will September Confirm The Seven Year Itch Fears? There has been a lot of talk on the street over the past weeks even months of a severe correction in the current Bull market. Last week may well prove to be the beginning of that retracement. The main worries for stocks over the past weeks has come from a slowdown in the Chinese economy with a growth rate that has shrunk to nearly half the rate four years ago. The latest Manufacturing PMI, China's largest industry, came in last Tuesday at 49.7. A level below 50 is considered to indicate a contracting economy. A slowdown of growth in China could lead to further declines in energy prices. The country is the world’s largest consumer of crude oil. This may put more pressure on the price of the commodity in the next months. Stock prices for a series of companies that work in the supply chain of crude will be affected. Then there is the knock on effect, markets may see energy price weakness as a result of the economy contracting overall. Another measure of how China’s slowing GDP can affect economies worldwide is the level of global trade. The WTO issued estimates of global trade for the first quarter of 2015 as having had slower growth than the previous six month period. Also US exports decelerated by 4.5% during the first quarter. Both factors can have a large weight on domestic economic performance. A reduction in exports is not surprising. The US Dollar has strengthened against most major and minor currencies over the past year. A rising currency makes American products much more expensive and less competitive. This trend will probably continue if the Fed (Federal Reserve) raises key interest rates sooner rather than later. This is the other main worry for the stock markets; the threat of an interest rate hike by the Fed in an economy that may not yet be ready to absorb such a restriction in monetary policy. High interest rates are associated with expanding economies. This is the thing, is the US economy expanding fast enough to accommodate higher interest rates? Raising interest rates may cool down economic activity if it happens too early. This could cause the economy to slow down or even contract again. The stock market has reflected its worry of rising interest rates after reaching its high in May at 2129.20. Since the beginning of the year the S&P has had a negative performance -5.2% compared to an average of 15.6% over the past 6 years. This year’s poor performance has coincided with insistent talk by the Fed of an imminent interest rate hike or hikes. Although the chances of a rate hike seem slimmer for September. Tuesday's 4 Week T-Bill Auction yield came out at 0.00% down from the previous auction at 0.045%. It would certainly seem that the Money Market traders do not see a hike coming just yet. Today’s Non-Farm Payrolls were released lower than expected, yet it did not stop the US dollar from strengthening. This indicates that the markets may still be expecting a possible move by the Fed before year end. Looking at employment data; we can see from the graph below that job creation is still strong but lower than it was in 2014. Yellen has repeatedly stated that one of the factors that would make an interest rate hike impelling would be high job creation. Although that doesn't seem to be the current scenario. With that in mind you are lead to think the Fed would put any rate hike decision on hold. That would seem logical, but Yellen may have other plans. Even putting off an interest rate hike until December may prove too early if employment data and GDP growth have not shown strong signs of improvement. The next quarterly data for GDP will be released on September 25th. The inflation and employment data may or may not be enough on its own to entice Yellen to begin raising interest rates for the first time in 10 years. The last interest rate hike by the FED happened in June 2006. There may be an incentive to normalize rates due to fears of what exactly are the consequences of a prolonged period with interest rates near zero. The FED does not have any experience of such a low interest rate scenario. Then there is, in my opinion, a legacy factor. The previous 10 years to Yellen’s arrival have been known for Quantitative Easing and loose monetary policy. Yellen could be concerned of being at the helm if that policy eventually proves disastrous. However she might be leading the US into an unintended economic meltdown if she raises interest rates too soon. Is 5% of your Net Wor th in gold and silver? Many famous investors, portfolio analysts and hedge fund managers believe that dedicating 5% to 10% of your net worth to precious metals like gold and silver is one of the best ways to protect your wealth and mitigate the damage in case of a major recession or systemic collapse. One of the easiest and safest ways to invest in metals is by converting part of your IRA, SEP, 401k or other retirement vehicle to a self-directed Precious Metals IRA. 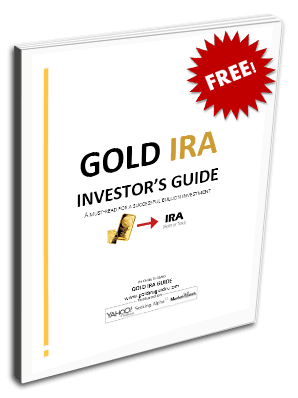 If you would like to learn more about this process, we highly recommend requesting the free gold IRA rollover kit from Regal Assets, our #1 ranked gold investment firm in 2015. Check out our full ratings of 60+ companies on this page.